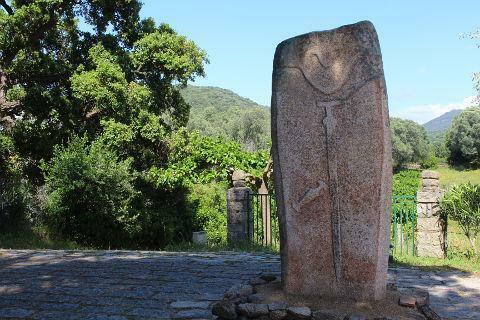 Filitosa has a magnificent array of prehistoric menhirs, and statues with the hard granite carved into human representations, for reasons that are not entirely known. The site was occupied perhaps 7000 years ago, with the carvings created around 3000 years ago. 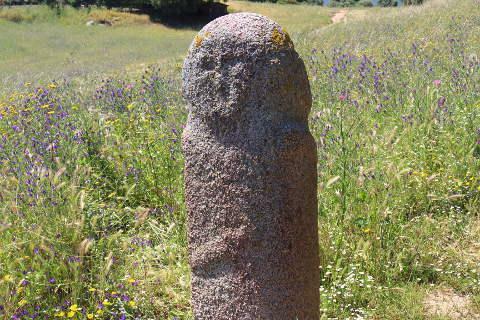 It is one of the most complete examples of Megalithic art in the Mediterranean area. Before you start your visit it is useful to recall that the current displays and groupings of the statues are a modern layout to show them at their best, and not an accurate recreation of their original (unknown) positions. Based on and around a central monument, the original purpose of the remarkable figures can only by guessed at, although it is thought to be an attempt to ward off invaders. The setting and landscape of the site is very lovely and when we visited in May was full of wildflowers. The menhirs are visited as part of a walk of about 1-2 kilometers. The first monument you see is the best preserved and is the man with a sword pictured above. This megalith is known as Filitosa V.
After this you will pass by a dwelling and a group of menhirs around the dwelling. 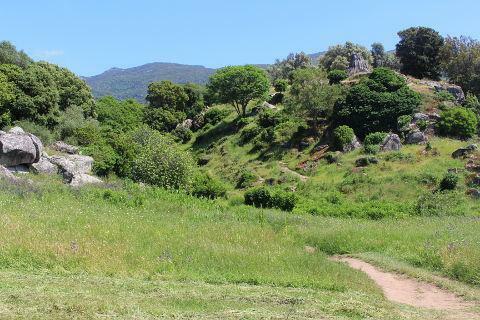 A little further away is another of the highlights of Filitosa, a group of menhirs gathered around the bottom of an ancient olive tree. 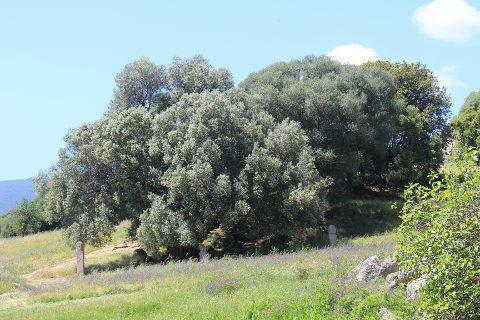 Behind the olive tree is the quarry from where the menhirs were extracted. As well as the menhirs and the pretty scenery there is a group of rocks with one shaped like a dinosaur - very popular with the children and the views from here back over the site are excellent. Further menhirs can be seen in the museum. Entrance to the site is 7 euros and there is a cafe and gift shop on the site. 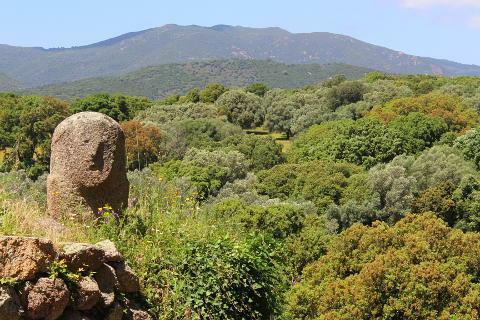 Also in the south west of Corsica is the beach resort of Propriano with some popular beaches and a small marina. South of here Sartene is a lovely village with a charming old town of narrow streets and alleys. 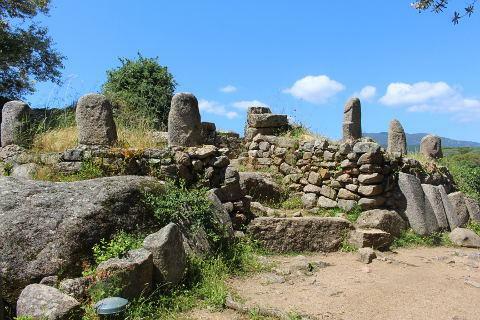 If you liked Filitosa you may also want to visit Palaghju which contains a large concentration of menhirs. 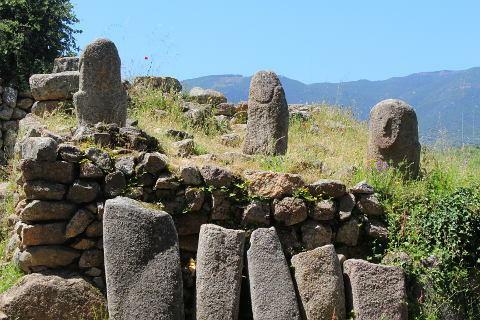 It is home to 258 megaliths and 70 menhirs.